Watch: Gov. 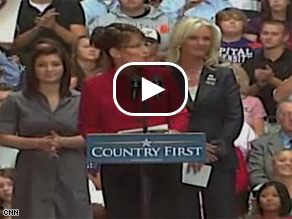 Sarah Palin talks about McCain's performance in Friday's debate and what can be expected from her on Thursday. COLUMBUS, Ohio (CNN) - Before hunkering down at John McCain's Arizona ranch for three days of debate boot camp, Sarah Palin used a Monday rally in Ohio to throw a few jabs at her Democratic counterpart, Sen. Joseph Biden. She started by taking a swipe at Biden's age and 36-year tenure in the United States Senate. "I do look forward to Thursday night and debating Sen. Joe Biden," Palin said while introducing John McCain at a rally here. "We are going to talk about those new ideas, new energy for America. I'm looking forward to meeting him too. I've never met him before. But I've been hearing about his Senate speeches since I was in, like, second grade." Palin, 44, would have been eight years old when Biden was first elected to the Senate in 1972 at the age of 29. John McCain was 36. Palin turned 18 in 1982, the year McCain was first elected to Congress at the age of 46. If elected, McCain, 72, would become the oldest president in United States history. The Alaska governor has generally shied away from attacking Biden directly while on the trail, although she did use the "second grade" remark in an interview with Fox News two weeks ago. But Monday marked the first time she has openly engaged Biden in her stump speech. She also challenged her vice presidential opponent on policy grounds. Speaking in a state that's among the nation's leaders in coal output, consumption and reserves, Palin tried to capitalize on Biden's recent criticism of coal production as environmentally hazardous. "We're not supporting clean coal," Biden said last week in Maumee, Ohio. "No coal plants here in America. Build 'em, if they're gonna build 'em, over there and make 'em clean because they're killing ya." Palin promised that a McCain administration will utilize clean coal technologies that seek to mitigate the environmental impact of coal production and use. "Just recently, Sen. Biden made it perfectly clear that in an Obama-Biden administration, there would no use of clean coal at all," she said, drawing boos from the audience. "From Wyoming to West Virginia and especially right here in Ohio, American coal resources are greater than the oil riches of the Middle East. "And yet Joe Biden says, 'Sorry Ohio, we're not going to use it.' As for Sen. McCain and I, we will make clean coal a reality, and to help power the American economy with clean coal technology, we're going to look to the hard working people of Ohio to help us do that." I thought she quit school in the third grade. Second grade wow, now that explain everything. She should have stayed another year. I feel sorry for palin, I mean how much more trashy can mccain get Also, I heard that CSB has more footage of the kate palin interview. And the word is, that it is worseeeeeeeeer than the released footage.